This entry was posted on March 10, 2016 by Sew Essential. We started stocking Tilly sewing patterns a couple of months ago and I really wanted to make one of them to see what all the fuss was about. 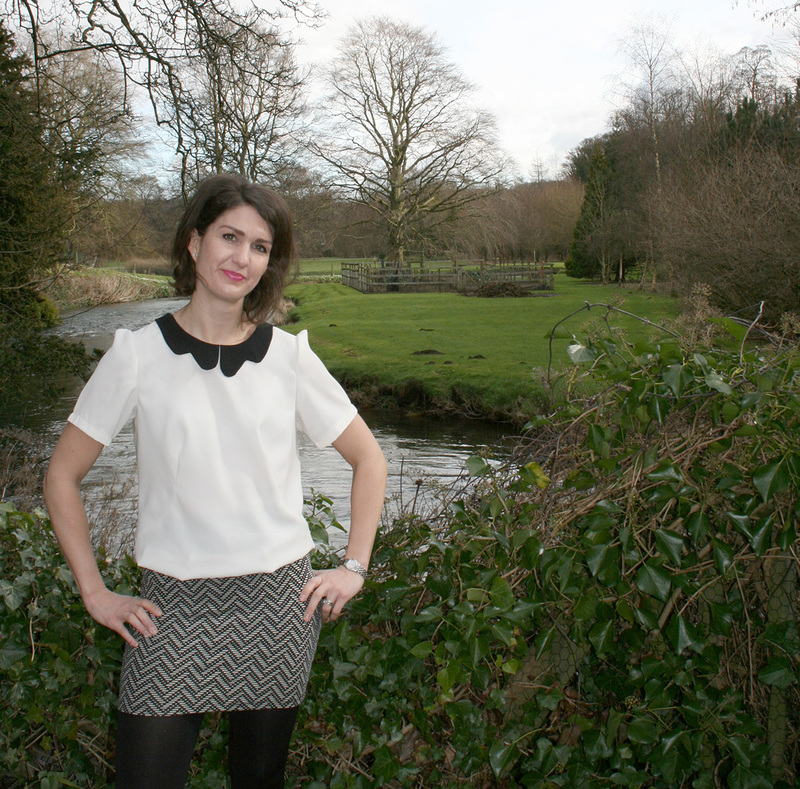 I chose the Orla blouse because I thought it had a lovely, unusual collar and I liked the shape of the blouse itself. 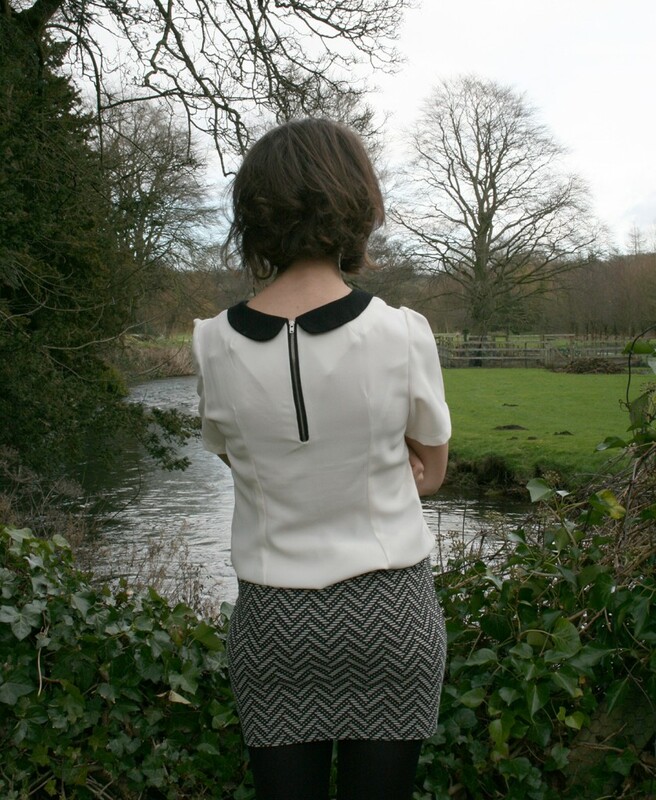 I also really like the retro feel of this design and decided to make a monochrome version in our Prestige crepe in cream and black in a nod to the swinging sixties. I was getting kind of cocky after my red dress success and all the lessons I learned along the way on that make so I pressed on un-supervised this time. 'I'm going to be a sewing pro in no time' went the mantra in my little head as I happily cut out the fabric on my dining table humming away. Then I realised I had made the most fundamental error ever - I lined the pattern pieces that were supposed to be cut on the fold up with the selvage! Arrrrrggggghhhh went the new theme tune in my little head! I couldn't believe I had done it! Lesson number one from this make: don't get cocky you're new to this game! Anyway I used the pieces to make a mock up, which fitted perfectly so all was not lost. Once I started sewing I could see why people love Tilly's sewing patterns - the instructions were super easy to follow thanks to the photographs and detailed descriptions. Despite my ridiculous cutting incident they helped me feel confident about making the top and I was humming happily again. I thought the collar might be a bit tricky to make, but it was actually really easy. Until I turned it the right way out. Then I realised I had been rather heavy handed with the snipping to reduce the bulk and had gone over the stitch line in a couple of places (sad face). I used my initiative and sewed just inside the stitch line to put it right and made a note of lesson number two: don't get scissor happy, it is very exciting all this sewing malarkey, but calm down dear! I also hand stitched the collar pieces together at the top to keep it together when I machine stitched it to the bodice, which seemed to work well. The sleeves were probably the bit I found the most challenging and enjoyable and I'm happy to say I conquered my first pair of sleeves - yay! I went for the cropped sleeve version, but cut them quite a bit shorter than the pattern suggested just down to personal preference really. I loved putting the little darts in and think they look really pretty. I will freely admit it took me several attempts to get the first sleeve in, but I persevered and eventually cracked it then the second one just flew in. I was so excited that I'd nailed it until, upon closer inspection, I realised the dart wasn't in line with the shoulder seam - soooo annoying! Anyway I unpicked that little section and stitched it back into the correct position. 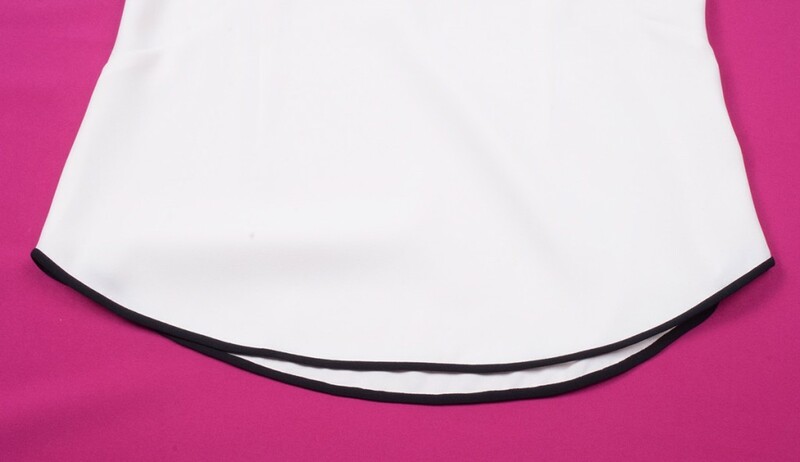 Another adaptation I made was to make my own black bias binding (we created a 'how to' tutorial which will go live on the blog imminently) and used this to trim the hem. I can't claim the idea as my own though, it was thanks to Angela's sister Chris who is also a very talented seamstress and whose son is Technical Design Manager at Burberry - we truly are a sewing family! I think it added a really nice touch that shows off the lovely curved hem and ties it in with the collar. Unfortunately I had the blouse tucked in on the day of the photo shoot and haven't had another opportunity to photograph it untucked, but you can see what I've done below. All in all this blouse was a joy to make and it does look exactly as I imagined. I can see why Tilly has recommended it for improvers because the sleeves are quite full and a bit tricky for a beginner like me. Having said that if you are a beginner who likes a challenge I would say go for it! The fit was extremely good and I didn't need to make any alterations. I'm fairly straight up and down and I think the darts in this blouse give me a more feminine silhouette which is always nice! The other little lesson I learned during this make is that sewing isn't like playing pool i.e. I am definitely NOT better at it after a drink! After having to abandon my sewing one evening after one glass of wine I have realised I won't be able to combine these two great loves, old and new, until I am a little more experienced. Hic! I'm still not sure about all this photography stuff, but figured if you're going to do it, try and do it properly so we (me and Ed) took some shots when we away in the Peak District for his birthday. It was a bit windy so I think the collar is flapping around a bit in some of them, but you get the gist! The facing on the back looks a bit distorted in the shots, but I think this is because I'm folding my arms and pulling the top slightly or it could be my handiwork. Either way I'm happy with my next little step on the road to sewing heaven, which I realise is still a long way off!